Brooklime plant, Veronica beccabunga, is usually found growing near water. The leaves are eaten raw in salad or cooked as a vegetable. Rich in chlorophyll, Vit A, Vit C and minerals. A European folk remedy for coughs, fevers, scurvy and skin disease. An infusion of leaves is used as a spring tonic. Brooklime plant is a native of UK and prefers moist soils, pond margins or stream banks in a protected, shaded position. Flowers from spring to summer. Frost resistant but drought tender. 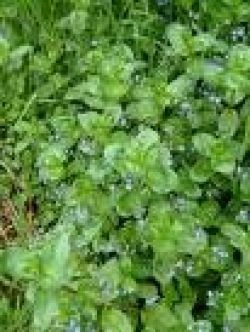 A perennial ground cover growing to a height of 0.45m with a spread of 1m. Be the first to review “Brooklime, plant” Click here to cancel reply.